Thank you to all of our shoppers and vendors for another successful Mothers Market! Special thanks to Panera Bread of Rockaway and Sparta, NJ for sponsoring the refreshments table and to Signarama of Clifton for donating the refreshments banner. The Spring Mothers Market is only 5 days away! We have many sponsors this year. 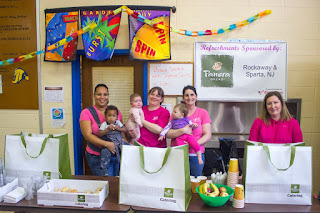 Panera of Rockaway and Sparta, NJ are sponsoring the refreshments table. There will be sandwiches, muffins, fresh fruit and cookies for sale in the cafeteria. Signarama of Clifton is sponsoring the banner for the refreshments table. Sponsoring the map of vendors is Alpine Montessori of Oak Ridge, NJ. Thank you to our sponsors! Your contributions mean a lot to After Baby Comes! Remember that the doors open at 10am for shoppers. Admission is $3 per person. Some vendors are accepting credit cards this market as well, so make sure to look at the map to see where they are located. We are pleased to announce that the Fall 2018 Mothers Market will take place on October 13th at the Jefferson Township Middle School from 10:00am-2:00pm. More information will be posted here and on the event's Facebook Page as it becomes available. Applications are now available for the Fall 2018 ABC Mothers Market! Please visit the links below to download the application or send a request to mothersmarketabc@gmail.com with the subject line "Add Mail" to have it emailed to you. Mothers Market tables will be assigned on a first-come, first-served basis. Due to the overwhelming popularity of the ABC Mother's Market and the number of vendors seeking tables, we are unable to take table location requests. Each vendor is only able to purchase one (1) table. If you would like to be placed next to another vendor please mark that information on your applications and we will make our best effort to meet your request. If you have any questions, please direct them to mothersmarketabc@gmail.com. We hope to see you in October! We are pleased to announce that the Spring 2018 Mothers Market will take place on April 28th at the Jefferson Township Middle School from 10:00am-2:00pm. More information will be posted here and on the event's Facebook Page as it becomes available. Applications are now available for the Spring 2018 ABC Mothers Market! Please visit the links below to download the application or send a request to mothersmarketabc@gmail.com with the subject line "Add Mail" to have it emailed to you. If you have any questions, please direct them to mothersmarketabc@gmail.com. We hope to see you in April!